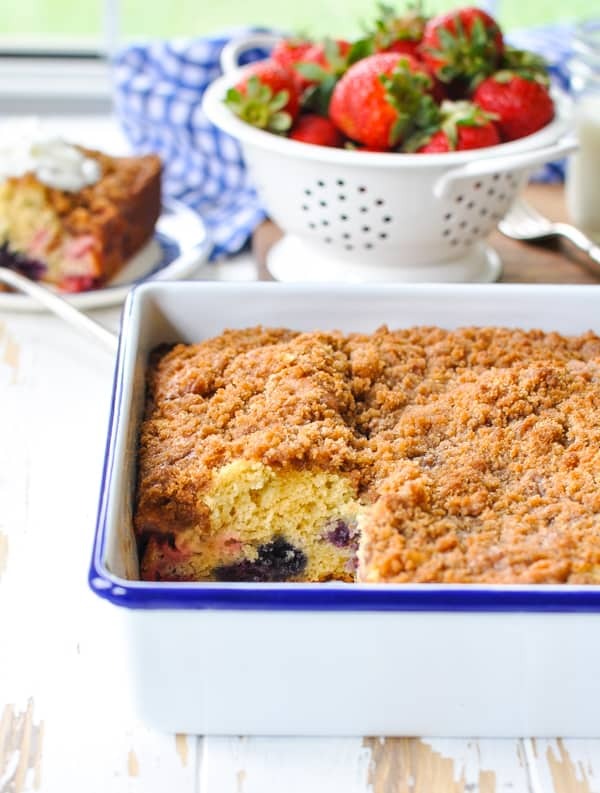 Enjoy fresh summer berries in this easy Red White and Blueberry Buckle! 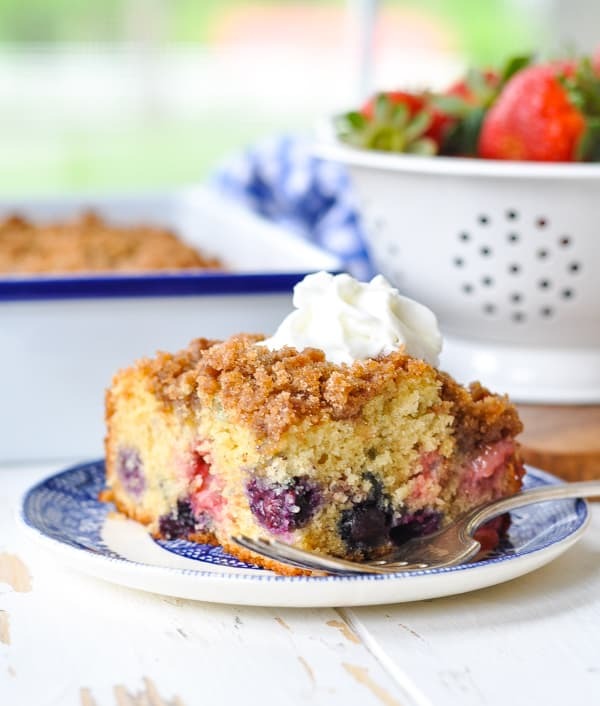 Whether you're looking for a Memorial Day breakfast or a Fourth of July dessert, this special treat is a simple addition to your festive menu! 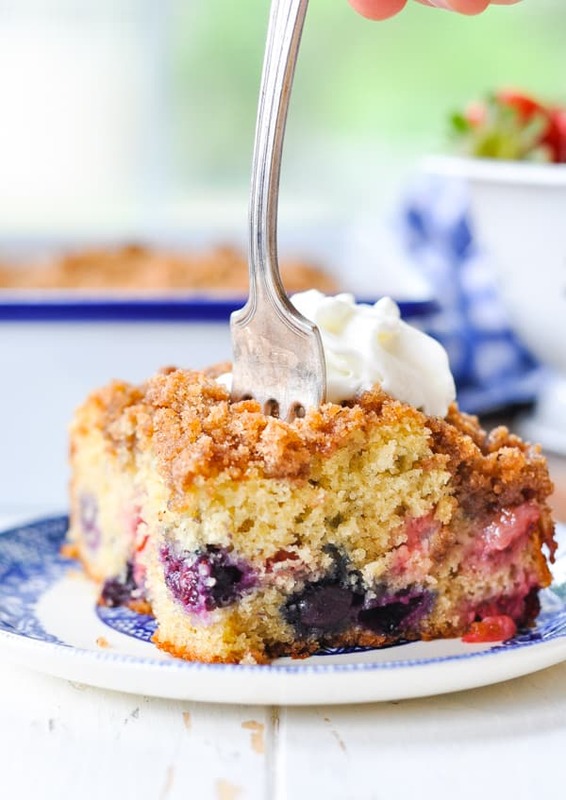 Enjoy fresh summer berries in this easy Red, White and Blueberry Buckle! 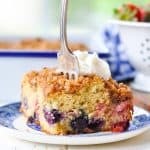 The moist cake is piled high with cinnamon streusel topping, making it a perfect vehicle for vanilla ice cream or whipped cream at your next potluck. Whether you’re looking for a Memorial Day breakfast or a Fourth of July dessert, this special treat is a simple addition to your festive menu! You’re probably familiar with a fruit crisp or a berry cobbler, but have you ever tried a buckle?! And no — I’m not referring to that buckle on your belt! What is a Buckle in Baking? I like to think of a buckle as pie’s “rustic” cousin! Buckle is a member of the cobbler family, but a coffee cake batter forms the base of the dish (rather than biscuit or pie dough). 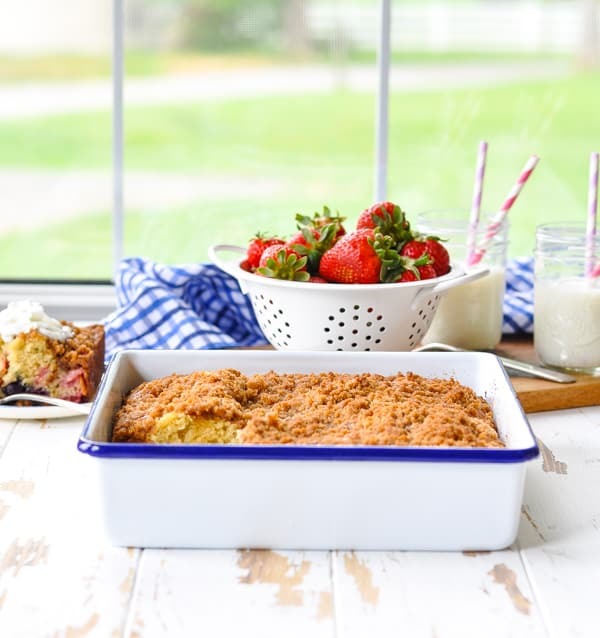 The cake batter is mixed with fresh fruit and finished with a crumbly streusel topping, which is baked until golden brown. 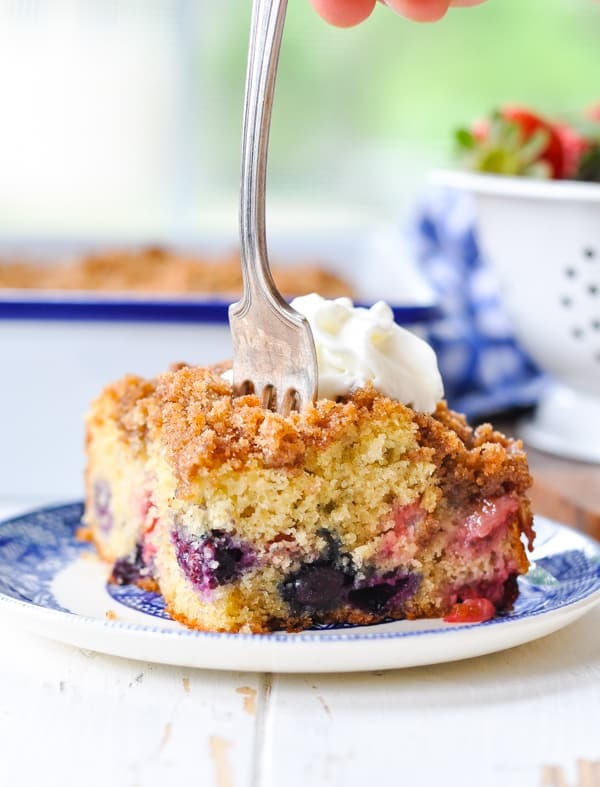 Whether you consider it a coffee cake and enjoy it for breakfast, or a dessert and serve it at a summer gathering with family and friends, you cannot go wrong with an old-fashioned Strawberry and Blueberry Buckle. The cake batter is moist and flavorful (thanks to all of that fruit! ), and the crumb topping is to-die-for! 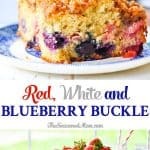 Plus, the blueberries, strawberries and whipped cream give my Old-Fashioned Buckle a festive touch that’s perfect for the upcoming Memorial Day or Fourth of July holidays! Why is it called a Buckle? Good question! I was wondering the same thing, so I did a little bit of quick research. 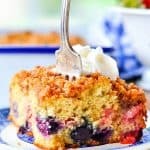 That explanation sounds as good as any other that I could dream up; however, I will say — there’s nothing flat or “weighed down” about this fluffy, thick Red, White and Blueberry Buckle! Spray a 9-inch square baking dish with cooking spray and set aside. In a large bowl, beat together butter, sugar, and eggs on high speed with an electric mixer until fluffy. Turn the mixer to low speed, and gradually add the dry ingredients alternately with the milk, just until combined. Gently fold in the blueberries and strawberries. Place flour, brown sugar, cinnamon and salt in a small bowl. Cut in butter until crumbly. Sprinkle crumb topping over batter. *You can substitute with frozen berries; however, do NOT thaw the berries before mixing them into the batter. What a beautiful cake! I really need to make a buckle cake soon as I haven’t made one in so long! I would like to repost it on my blog. Please contact me, and give me photo credits. I will redirect to your site!